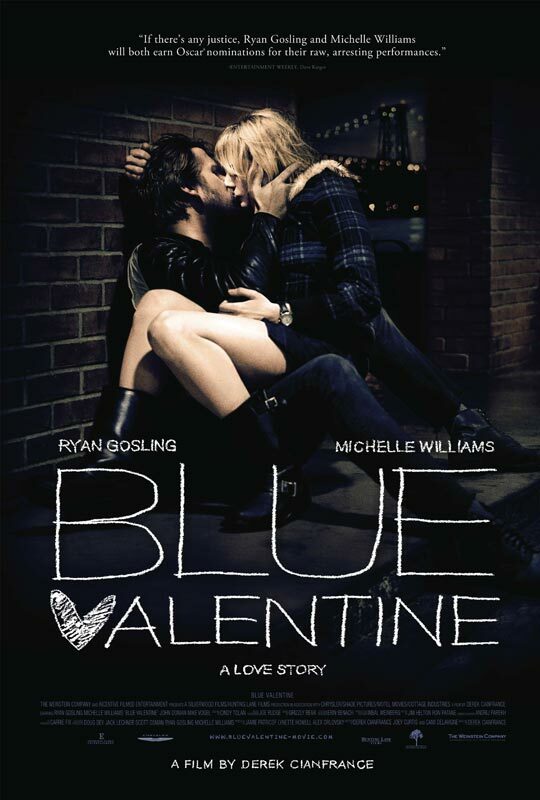 With an Oscar nomination for the best leading actress, Blue Valentine is a poignant portrait of a failed marriage. It is no Revolutionary Road, which is much nosier and about a bourgeois couple. Unlike 5×2, which shows a couple’s story in reverse chronological order, Blue Valentine interweaves the happy past with the unhappy present and creates a stark and heartbreaking contrast. The main characters are so realistic and three-dimensional that the audience will care about what happens to them. Dean is a lower-class man coming from a broken family. When young, he had dreams and never thought becoming a husband and a father could be one, but now, because of Cindy, it is. He truly loves Cindy, who is an ambitious nurse. Although she does not fancy Dean, she marries him because he is willing to take care of her baby whose father is her ex-boyfriend. After six years, she becomes dissatisfied. Dean may be right. “Girls spend their whole life looking for Prince Charming and then they marry the guy who’s got a good job and is gonna stick around.” Therefore, she keeps herself aloof from Dean, though he is good to her and her baby. It is worth noting that Cindy’s inability to form a stable romantic relationship and feelings of insecurity may be shaped by her abusive father. The three broken families show that marriage is fragile and passion dies away. Lies, suspicion, broken promises, fights, the wreckage of dreams, etc, seem inevitable. Michelle Williams and Ryan Gosling, whose facial expressions, body language and remarks can effectively convey their pent-up emotions, give convincing and powerful performances. Thanks to the capable and charismatic cast, the audience will be dragged into a stifling whirlpool of the lifelike characters’ growing frustrations. There are several scenes of immense tension, e.g. the future room, hospital, kitchen, etc. To my astonishment, Ryan Gosling can sing. In one of the most memorable scenes of the year, Dean sings while plucking the strings of his ukulele and Cindy tap dances, which reminds me of Once. The music sets the right atmosphere for the film. A romantic but melancholy mood is captured in this bittersweet love story. You and Me by Penny and the Quarters and You Always Hurt the One You Love by Ryan Gosling simply blow me away. Love is just like fireworks. They splutter, burst into dazzling sparks and go out. When passion eventually wanes, an aching emptiness reigns.